When you have UnderFloor Heating (UFH) you should prepare your wooden floor for the arrival of real Autumn/Winter period now, before the true heating season starts. UFH tends to dry out the wood a bit more than on average, so treating your floor with a maintenance polish (like a moisteriser) will keep it in good health and beautiful over the colder times of the year. It's never a good idea to apply a polish on a warm wooden surface, this can create patches of too quickly dried polish, therefore treat your wooden floor during a "sunny" day these coming weeks, before the UFH is switched on to higher levels. 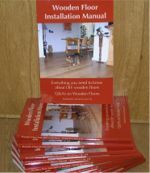 To know even more about maintaining your wooden floor, have a look at the "Ultmate Maintenance Guide" - filled with practical tips and advice and includes videos showing you how to wash and wax.